Inked Resistance Islamic Publishing is proud to offer this never-out-of-date favourite in a new edition. Moisture trickled from under the black scarf around Shaheedah’s head. The orange ball of the sun lay low in the west signalling sunset. Only when it disappeared would she find some relief from the oppressive heat that usually reached 120 degrees Fahrenheit in the shade. She would not shed a tear. Why should she when she knew her young uncle was happy now? He had often spoken of death. Shaheedah watched as his unshrouded blood-stained body was put into the warm earth. Amir had been her favourite, always there to listen to her and answer her unending questions. He made her feel grown-up. Even though he was a devout Muslim, he never pressured her. She would miss him. Her father had found Amir’s corpse outside the crumbling white wall surrounding her house. Someone, certainly the police, had thrown it there before sunrise. Both his legs had been broken at the knees and his face had been severely beaten. It was no surprise. Since Amir had turned twelve, he had valiantly participated in the Islamic struggle to rid their country of the rulers who were suffocating the freedom of the Muslims. Only this time, Amir had been picked up, carted off and returned in such a state as if to say, “This is your fate if you insist on rebellion. Be warned!” He had not failed in Shaheedah’s mind, although she never really understood the politics behind the struggle. But she knew deep in her heart, he was right. So begins Chapter One of the story that has touched hearts around the world. Since publication in 1992 by the Islamic Propagation Organization – International Relation Department - in the Islamic Republic of Iran, The Sandhills of Arabia has been sold throughout the world, including in Africa, Britain, Canada and the US. It, in a double novel combination with its sequel, The Diamond in the Sand, was translated into Indonesian by Elka Ferani, renamed The Sandhills of Arabia: Fate Robbed and published by Zahra Novel in Jakarta, Indonesia, in 2005. Sister Laila Hasib unveils humanity's prowess and weakness bit by bit in this tale. Shaheedah is tested through many trials in The Sandhills of Arabia. The page-turner takes you through the character's physical, emotional, and spiritual journey as she comes into her identity as a young, brave, and resolute Muslimah. The novella provides insight and contrast into the lives of how different one community can be and by juxtaposing Muslim Shaheedah with Catholic Mary. But Sister Laila expands our thinking about the multitudes of one's identity as we witness Shaheedah's patience in a war-torn country, her softness in love, and her understanding in friendship. The Sandhills of Arabia is also a love story about a young woman and a young man. It got a bit cheesy and corny but in a good way. The fierce and rebellious protagonist Shaheedah has to have some kind of soft point. In addition, the plight of her friend Mary will remind you of what the Catholic monarchs did in Spain by stripping Muslim parents of their children or “adopting” children according to them. Favorite quote: “Learn from our compassion,” one Muslim character said. It goes without saying that literature in general, and fiction in particular, has great influence on readers, disregarding age, class and knowledge. Thus, fiction in all its forms has been an attractive means of cultural communication, through which ideas, experiences and information, good or bad, could be transplanted into the minds of readers for different purposes. The imperialists – and before them the colonialists – who spare no means whatsoever in carrying out their aims, could not overlook such a weapon which never misses its target. Consequently, they allotted great fortunes to buy off the pens of the novelists at high prices, to pass their imperialistic ideas through those pens in order to camouflage their plans and deceive the people. Yet, the job was not as easy as they thought it to be. There were many resisting obstacles in their way. Religion was the biggest one. So they had to remove it out of the way. Even though all original religions reject all forms of injustice, corruption, oppression, aggression, superstitions and myths – all of which are among the weapons depended upon by the istikbar (the arrogant powers) in implementing its objectives – they did succeed in some instances and emptied the divine religions of their original content and turned them into mere hollow skeletons…that religion meant nothing but to abstain from worldly affairs and completely turn to the other world, the Hereafter. ...The incidents of the story are supposed to have taken place in the state of Kuwait during the Iraqi occupation. They are intended to portray the invaders’ brutality, though not as brutal as they actually were. We do hope that this praiseworthy attempt of Laila Hasib would be a good incitation prompting other qualified Muslim writers to follow her example, as a valuable service to Islam and the Muslims, and an effective refutation of disbelief and disbelievers! One of my all-time favorites. I cry every time I read it. Laila Hasib has penned a beautiful script about friendship, love, truth and identity. Pigeonholing it as a young adult book is wrong. Even adults will end up shedding at least one tear by the end. 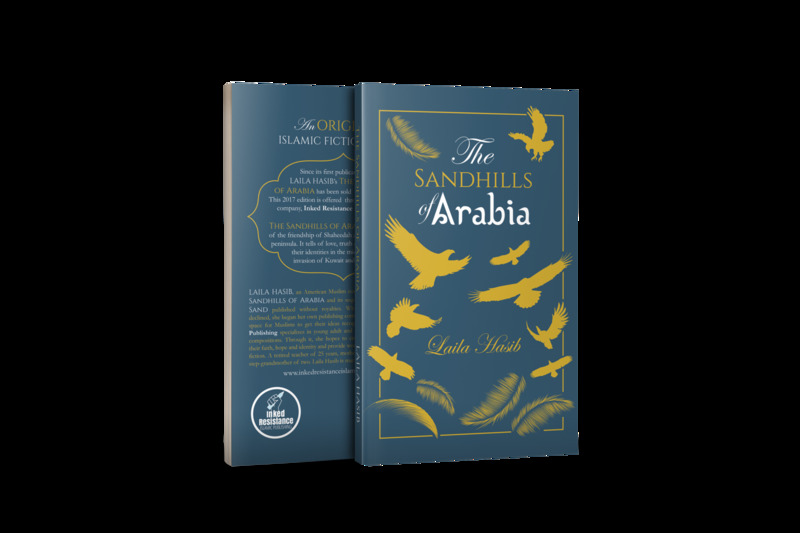 The Sandhills of Arabia is the starting point for a fantastic library of Islamic young adult fiction books. Laila Hasib must be congratulated and honoured for her poignant writing, views of the world and her love for our youth. Laila Hasib is the author of several young adult novels. She is making her publishing debut with her own unique publishing company, Inked Resistance Islamic Publishing. She is honoured to offer young adults and new adults the opportunity to have their voices heard through her company.